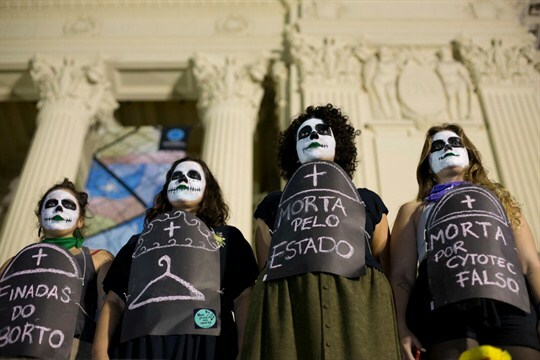 Pro-choice demonstrators wear signs that say “Death by abortion” to show support for the legalization of abortion in Argentina, Rio de Janeiro, Brazil, Aug. 8, 2018 (AP photo by Silvia Izquierdo). In this week’s Trend Lines podcast, WPR’s editor-in-chief, Judah Grunstein, and managing editor, Frederick Deknatel, discuss the standoff in Washington over President Donald Trump’s border wall and the crisis in Central America it overshadows. For the Report, Anna-Catherine Brigida talks with WPR’s senior editor, Robbie Corey-Boulet, about recent progress made by abortion rights activists in Latin America and the challenges they continue to face in liberalizing the region’s strict abortion laws.